Alara Hotel Icmeler, Hotel Turkey. Limited Time Offer! Alara Hotel. "Alara Hotel" is an ideal base point from which to discover Icmeler. The accommodation includes a restaurant. For a drink before or after dinner, visitors will find the bar most welcoming. Breakfast is served in the morning to give guests a good start to a new day. Internet access is available at no extra charge. 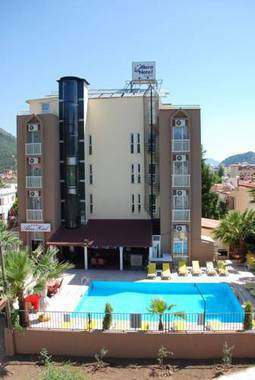 This 2 star hotel is located in the city centre of Icmeler.